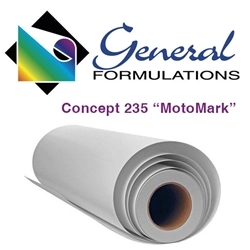 Concept 235 MotoMark 4.0 mil "GRIP" is specially formulated premium flexible matte white PVC film. This film has unique "High Bond" acrylic pressure sensitive adhesive with a 90# layflat liner. The adhesive is formulated for the powersport graphic and decal markets. Concept 235 MotoMark can be printed on a variety of solve-based, latex, UV and thermal printers that are commonly used in wide format. This product may also be printed on using other printing processes such as UV screen and UV curable offset but must be tested before production. Concept 235 MotoMark is designed for applications where a flexible premium film with special high bond adhesion is required. Concept 235 MotoMark is recommended for applications such as Quads, Snowmobiles, Motocross, Powersport Vehicles, Helmets and Carts. Testing is always suggested before application.
? Recommended to use Concept 238 MotoMark 12 mil "ARMOR" Gloss clear UV overlaminate. This will add ultimate protection, performance and durability to the graphic or decal.